Malignant tumors are a major cause of death. The lack of methods that provide an early diagnosis and adequate treatment of cancers is the main obstacle to precision medicine. The C-X-C chemokine receptor 4 (CXCR4) is overexpressed in various tumors and plays a key role in tumor pathogenesis. Therefore, CXCR4-targeted molecular imaging can quickly and accurately detect and quantify CXCR4 abnormalities in real time. The expression level and activation status of CXCR4 are very important for screening susceptible populations and providing an accurate diagnosis and optimal treatment. In view of the fact that radionuclide-labeled peptides have become widely used for the diagnosis and treatment of tumors, this manuscript reviews the potential of different radionuclide-labeled peptide inhibitors for the targeted imaging of CXCR4- positive tumors and targeted treatment. The article also discusses the specificity and in vivo distribution of radionuclide-labeled peptide inhibitors, and translation of these inhibitors to the clinic. Keywords: Chemokine Receptor, CXCR4, Imgaing, Theranostics, Radionuclides, SPECT. Keywords:Chemokine Receptor, CXCR4, Imgaing, Theranostics, Radionuclides, SPECT. Abstract:Malignant tumors are a major cause of death. The lack of methods that provide an early diagnosis and adequate treatment of cancers is the main obstacle to precision medicine. The C-X-C chemokine receptor 4 (CXCR4) is overexpressed in various tumors and plays a key role in tumor pathogenesis. Therefore, CXCR4-targeted molecular imaging can quickly and accurately detect and quantify CXCR4 abnormalities in real time. The expression level and activation status of CXCR4 are very important for screening susceptible populations and providing an accurate diagnosis and optimal treatment. 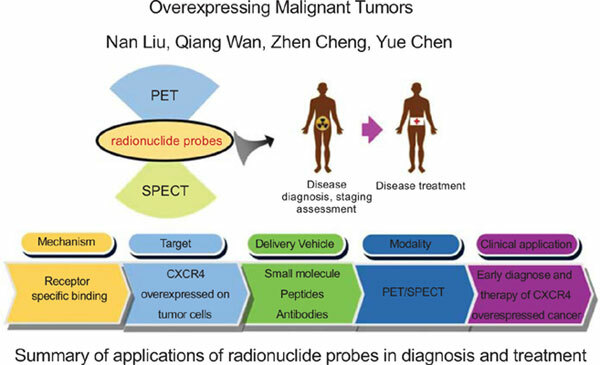 In view of the fact that radionuclide-labeled peptides have become widely used for the diagnosis and treatment of tumors, this manuscript reviews the potential of different radionuclide-labeled peptide inhibitors for the targeted imaging of CXCR4- positive tumors and targeted treatment. The article also discusses the specificity and in vivo distribution of radionuclide-labeled peptide inhibitors, and translation of these inhibitors to the clinic.